Last week I received this beautiful and colorful hardcover book titled "Today I Am" from Fish Book Co Pte Ltd. 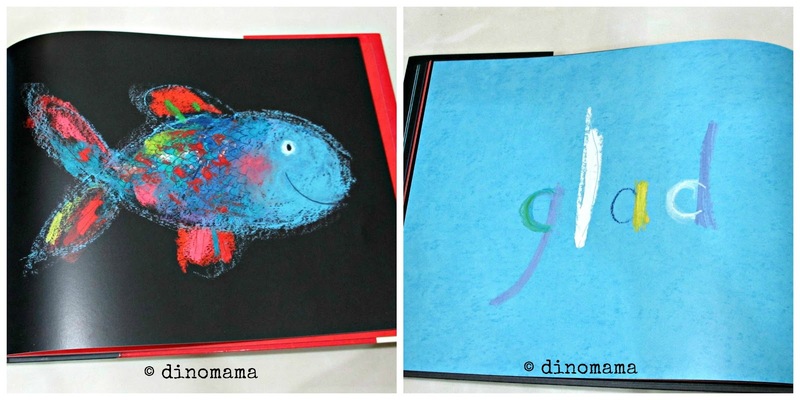 I was already attracted to the book by looking at the colorful happy fish on the front cover even before I started to flip through the pages. 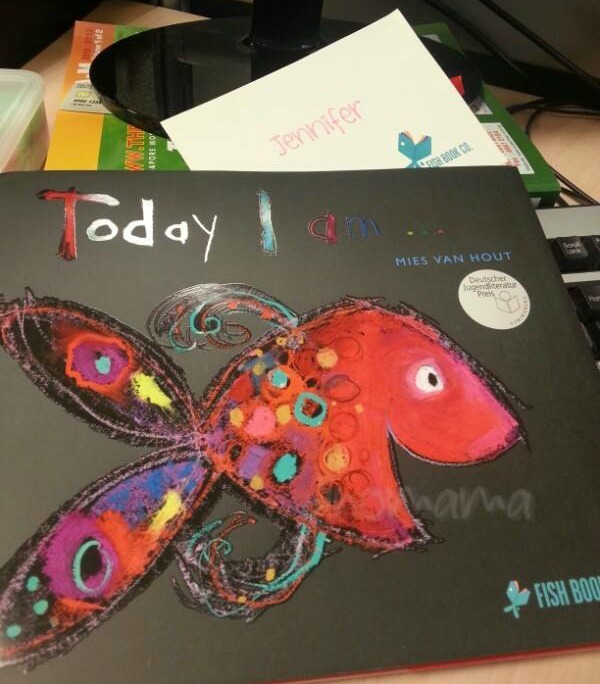 For some of you who are not aware, "Today I Am" is the Southeast Asian English version of the award-winning Dutch children’s book “Vrolijk” by Mies van Hout. First published in June 2011 in the Netherlands, “Vrolijk” has since garnered numerous accolades, including being nominated for the prestigious Deutscher Jugendliteraturpreis (German children’s Literature Award) 2013. “Vrolijk” has since been translated into many languages including German, Italian, French and Basque. In “Today I Am” Mies shows all the emotions a young child encounters. 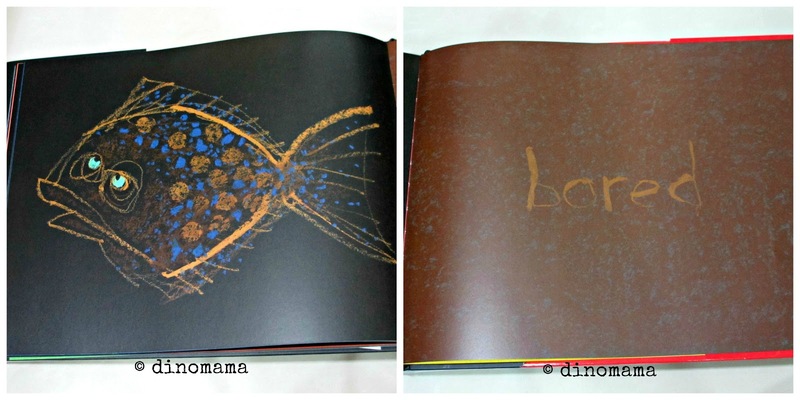 Each double page spread is devoted to one fish showing a particular emotion, along with its name in lettering that expresses the same feeling. 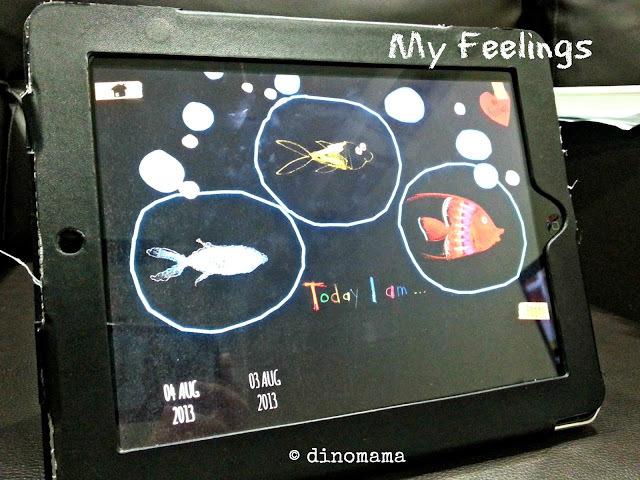 Dive into “Today I Am” and meet the most dazzling fish that spark laughter and empathy. "Today I Am" is suitable for children age 2 - 10 years old, but I am sure it will be a must-have book for all parents. Before I go any further, I must state that this review was made possible with the help of my sister who came over for a visit and was sharing this book with her 7 year old girl. Regrettably, DinoBoy was not very interested in the book even though he was sitting beside them. Perhaps it was due to the fact that he is an advance reader and is currently into chapter books so pictures with only ONE words does not interest him. So, while my sis was going through the book with Cousin Han, I was sitting at the side listening and observing. From their conversations, it was clear that besides seeing all the very colorful fishes of different expressions and emotions, they also saw some "deeper meaning" to each individual fish. Needless to say, sis was having a good discussion with Cousin Han about it and both of them enjoyed the book a lot. Let's see if you can answer the following questions. 1. Why is the Loving Fish drawn to look like a heart shape? 2. 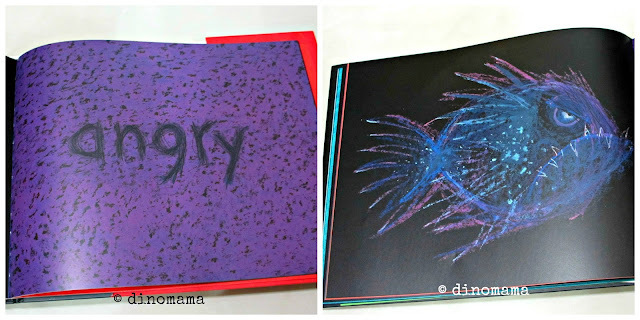 Why is the Angry Fish purple drawn with sharp pointy strokes? 3. Why is Brown choose to be the color for the Bored Fish? 4. Why is Furious Fish drawn with eyes squeezed shut tightly and a down turned open mouth? 5. Why is the Glad Fish so colorful and showing both cool & warm colors? Even though the book states that it is suitable for 2 - 10 years old children, I guess parents with younger children who is still unable to speak words or express themselves clearly will benefit more from it. If the child was given this book they will be able to let the parent know their current feelings by perhaps pointing to the fish showing that emotions. Here is another great way to enjoy the book even while traveling or when you don't want to bring the book out. 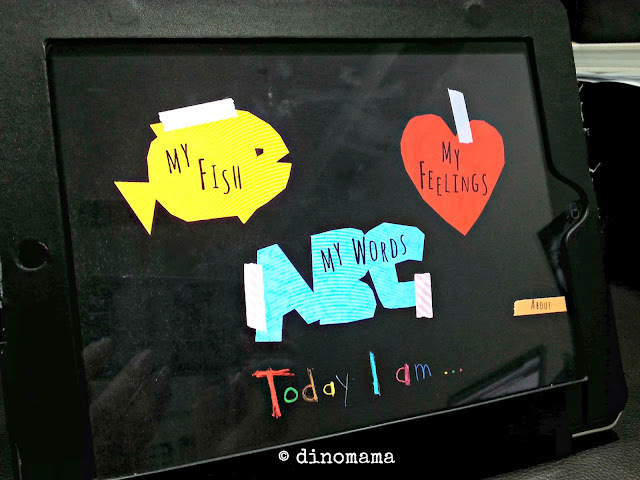 "Today I Am" comes in a fun and interactive iPad app that allows children not only to read on the go but also they are able to record their daily emotions and discover new word. Here is the ebook version of the book, the child will have a great time swiping the iPad to see each fish and words. Not sure why there are 3 bubbles for the child to drag the fish into it, perhaps to let the child record his emotions from morning to noon till night? It will be a great tool for the parents to keep track their child's emotions and do some conditioning work before bed time should the child shows negative emotions at the end of the day. 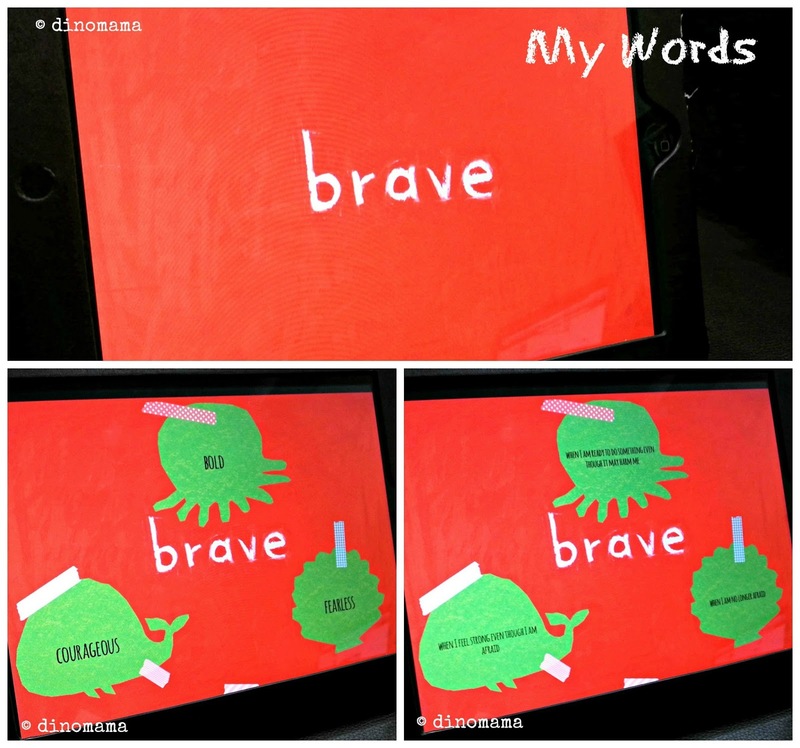 I love the "My Words" tools, not only did it explain the feelings of the word with just 3 simple word but it further breaks down the 3 words into simpler term that is easier for younger children to understand and relate to. 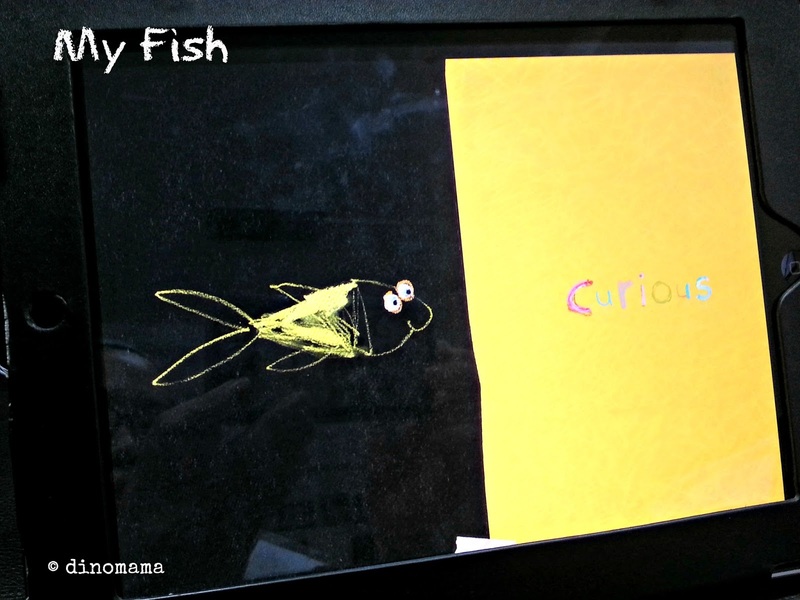 Now that we have shown you how great this book and its iPad app is, here is a little bit information about the nice people over at Fish Book Co. Pte Ltd. Fish Book Co. Pte Ltd recognizes the importance of emotional awareness in the development of happy and healthy children, and believes that all emotions should be equally embraced. They aim to provide parents, teachers, children, and adults with an ark of educational tools to keep them afloat through all emotions. Having secured the book’s rights to Southeast Asia, they have plans to translate ”Today I Am” into Chinese, Bahasa, Thai, Viet, and other languages for distribution throughout Southeast Asia. Isn't this such a wonderful news? What's more! These nice people at Fish Book Co. Pte Ltd have agreed to sponsor 5 copies of "Today I Am" for me to give them to 5 of my very loyal and very lucky readers! Let's all say HOORAY!!! now~~ What's more, this giveaway is open WORLDWIDE!!!! C'mon people, make some noise to show that you are super duper happy about this~ YAY!!! Ok, calm down now and see how to qualify for the giveaway. You just have to follow the very simple steps below. 1. Participate in the giveaway through the Rafflecopter widget below. 2. Leave a comment below this blog post with at least one answer to the 5 questions above. This is just for fun and of course to make you leave a comment below, I just want to hear your views so there is no right or wrong answer. 4. We do not like to say this but incomplete info will means that we have to strike off your chance to win the giveaway *so sad*. 5. 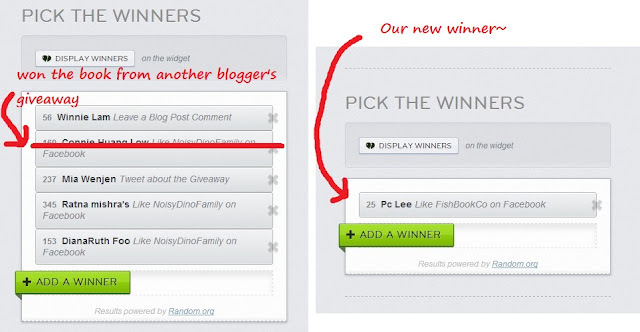 Giveaway will end on 16 August 2013 @ 2359hrs and winners will be announced in our blog and facebook page on week 19 August 2013. 6. Giveaway is open WORLDWIDE. NOTE : All comments with personal information will be removed immediately after the giveaway ends. Remarks : We were given a copy of "Today I Am" for review purpose. 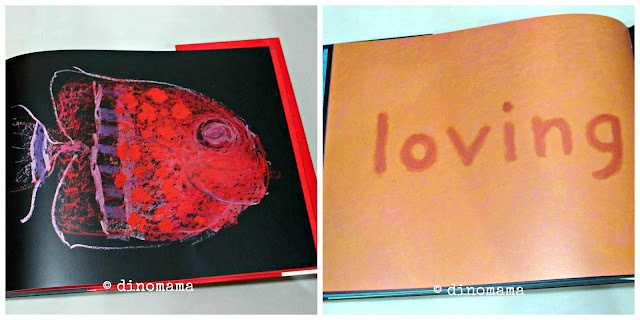 All photos & opinions are 100% based on our reading experience about the book. 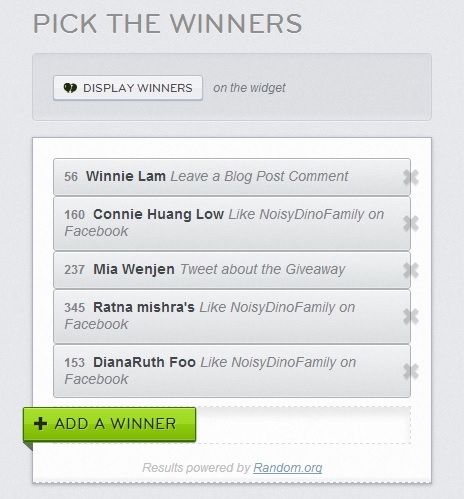 HERE ARE THE 5 LUCKY WINNERS! Re-Announcement of the Lucky Winners! Our 2nd Number 5 winner also won a book from another blogger's giveaway~ We have to redraw again and finally got our Number 5 winner! 3. Brown is very apt to show boredom! 4. The furious fish is shouting. Wow Shirley, you are very good! I like! The angry fish feels like it wants to poke others! the loving fish wears its heart on its body, fins, scales and tail!!!! the glad fish wants to spread joy through appreciation of the multicolours in life. 1. Because you love with your heart! 2. To attack those who made him angry. 3. Because brown is boring. 5. He's a cool dude. Question number 4. Because his eyes hurt so he is crying really loud. Pls leave your name and email so that we can contact you. Sorry! Its Justina here. At john(dot)jus(at)gmail(dot)com. 1. Loving cos heart represents love and he is smiling oh so lovingly. 2. sharp strokes cos you will hurt others with your words and actions when you are angry. 3. Brown is a safe and neutral colour. 4. Other fish made him angry and he is screaming at them. 5. When you are glad, you feel calm and yet full of warmth. 1. Hearts are a symbol of love. 2. Sometimes when we are angry we hurt other people. 5. She's learned to be content no matter his situation. 2. cos it's wise to stay away when mommy is angry. 4. cos one gets wrinkles and droopy chin from screaming too much. I especially like the heart shape fish as i would say the heart shape reminds us to use our heart to spread our love around. 5. glad fish is in harmony with himself, hence a balance of cool and warm colours within him. I love the colors/illustrations in this book. The bored fish is brown because brown is considered a dull color. That picture is hysterical. I love the fishes eyes. I love a great picture book. Great post and thanks for the opportunity to enter. I am going to mention you on my blog on Saturday, when Dino tells his story...he will be thrilled to have another dinosaur running around. DINOS RULE! 1. Because the fish feels by its heart! 2. To represent anger, keep out! 4. To represent, stay away or I'll bite! 5. To represent it's bursting with a rainbow of colours! Furious Fish is so furious that he is about to explode! That's why his eyes are shut and about to burst!! His lips are downturned because he is so angry and upset! hehe... would love to win this colourful book full of expressions because my son loves to draw fish! It would be so cool to show him that he can draw fish with great emotions! 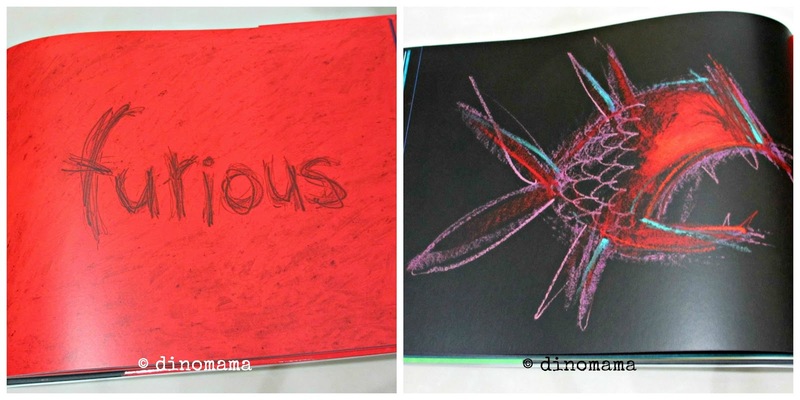 Love your book and the creative, adorable crafts that go with it! 1. Hearts are an almost universal symbol of love, something kids can relate to. 2.Anger is a sharp and pointy emotion and it tends to poke others as well. 3. Brown kind of feels boring and unexciting unlike other colors that seem bright and exciting. 4.I have yet to see a furious person who wasn't frowning with narrowed eyes. 5.Happiness radiates in different ways from different people, but almost always with a smile.